Lived in Malaysia from late 1979, for 7 years. Death of husband Bill McWilliam (golfer) 2008. Ladies Australian Hickory Shaft Champion in 1999 & 2000. Name of interviewee/ narrator Margery McWilliam. Sometimes referred to as Marge but known correctly as Margery. Additional documentation, images and artefacts Information about Margery is available online. 0:00 -0:99 Project introduction AGHS –Australian Golf Heritage Society. 1:00 – Standard Genealogical information: DOB: Born in 26/6/1926 (date provided by daughter). Aged, 89 (provided by daughter). Born in Bathurst, NSW. Her father was with the Department of Agriculture. Moved from Bathurst to Wyong then Goulburn because of her father’s job. Had a rural upbringing. Met her husband in Goulburn when he was in the army. Margery married 7/2/1948 Goulburn. Margery didn’t play golf as a child, started playing in her 20s. Attended school in Wyong. When she got married her husband was the golf professional at Goulburn Golf Course. He later took up the position at Beverley Park in NSW. Her brother and father were both golf champions and her father had helped design the course at Wyong. Her mother played golf at Goulburn at Tully Park Golf Club, Goulburn, named after someone on the council. Margery had a sister who died from Cancer and her brother, the club champion at Goulburn Golf Club. Goulburn Golf Club was a good club to play at but the club didn’t encourage young people to join as a danger on the course was that a train line ran through the course so players had to stop and wait for trains travelling through. Her husband ensured the course was cared for, fertilised appropriately – response given when asked about Goulburn being in a drought area. Margery Grace McWilliam, sometimes called Marge, but more correctly and commonly Margery is used. 38 Chantry Street, Goulburn NSW – Tully Park Golf Club. Margery comes from a golfing family. Blackshaw Rd Goulburn, NSW – Goulburn Golf Club. ))NSW 2580Margery’s husband is Golf Professional, Bill McWilliam (deceased). 11:45 Work additional to homemaker, mother and work for golf: worked for a solicitor at the courthouse in Goulburn during the war. Her father was in charge of providing steel posts and wood to people on the land during the war years. 14:19 Margery had three children. She used to do the books and accounts for her husband as the Golf Professional at Beverley Park. Margery used to play at the golf club and also played in the competitions. She made good friends, thinks she’s outlived most of them. Beverley Park Golf Club in St George district, Southern Sydney, NSW. 18:30 Margery was in the NSW State Hockey Team. After being injured with a black eye in a hockey match her father encouraged Margery to take up golf instead of hockey. Funny retelling of having a black eye. Overall, Margery’s family was very ‘sporty’. 21:00 Descriptions of team golf outfits – matching skirt and sweater. Ladies clubs compared to the clubs used by men. Margery has noticed that Golf, like any sport, has made great improvements in its equipment. Her favourite golf brand was whatever let her hit the ball best! She didn’t use a golf caddy. She only had her bag pulled for her on grade days. In ‘those’ days you had someone who was in the team caddy for you on a special occasion. Female players had female caddies. 24:55 Played in Malaysia at Royal Selangor Golf Club and did well in competitions, won the Foursomes, received many trophies over the years. She and Bill lived in Malaysia with Bill as the Golf Professional for seven years. Living in Malaysia was very enjoyable. This was when her children were older and grown-up from approximately 1979. Margery also did the books for the club office; she was very busy with club life and business. Kuala Lumpur Malaysia – Royal Selangor Golf Club. 27:27 Margery’s assistance was for female Golf players. She was on a committee at Bonnie Doon. Margery explained that at most clubs the male and female committees were separate apart from organisation for mixed play. The atmosphere between male and female organisers was always very friendly. 29:28 Major honours: NSW Sports Federation Distinguished Long Service Award, New South Wales Sports Awards, 2006 and Australia Day 2008 Order of Australia medal. Margery was always thrilled for what she was doing for the clubs. Margery referred to the lessons given by Golf Professionals such as her husband. He was very patient. Bill also taught children at Beverley Park for free. Margery did not teach golf. Bill tied to help Margery with her game. Bill was especially patient with new players. Interviewer mistakenly gives wrong year for the NSW Sports Awards. Bill McWilliam was also awarded an Order of Australia medal. Probably they are a very unusual couple to both receive the prestigious honour. 34:18 Margery thinks Australia is good for golf as well as all sorts of sports because of the space and the climate. Margery thinks Karrie Webb is an excellent Australian player and also considers Sarah Kemp is excellent. Karrie Webb and Sarah Kemp are two major Australian female golfers. 36:25 Thinks players who earn millions of dollars to play golf are “jolly lucky”. 37:00 International influences on Australian golf – everyone helped each other for the games. American golf influenced Australian players; Americans were leaders. Australian female players were “able to hold their own”. American golf helped improve the game. Mentions Sarah Kemp was taught by her husband, Bill. Interruption of knock and comment from Stella Maris employee removed at this point. Comments about her family’s connections to golf. 40:20 Green keepers today take pride in their work; they do the best they can. 41:20 Margery loves watching golf on television and delights in being an armchair critic. She loves watching golf and stays up late to watch it on television. 42:28 What is meant by the expression ‘Golf is a funny game’. Margery made a joke about counting the shots. Margery, instead of referring to golf as a ‘funny’ game made comments about the complexity and challenges of the game. 43:46 Margery’s advice to up and coming players. Margery suggests players test themselves against amateurs before trying professional competition. 44:43 Life on a committee: no troubles or arguments people are there to do a job. Sometimes a committee member would have a different point of view. Everyone was interested in doing the best for the clubs; for the competitions and the players. 45:50 Australian selector – doing her best for the clubs and the players. Margery didn’t have trouble with the teams. She did her best to help players. Margery always kept track of their scores Australian selector:1977-1979 In Perth for one selection period. 47:20 Professional Golf Australia and Golf Australia (Amateur Golf Association) – was involved with both. 50:46 Conclusion and final comments. Not everyone can be a champion but golf is a good game for people to play. 0:38 Bill McWilliam taught golf to the King of Malaysia. He was picked up by the king’s plane and flown to the palace for lessons. He had to follow protocol and be aware of time constraints. Lessons were held at Royal Selangor Golf course. The king’s daughter also played golf and had lessons with Bill. Both Margery and Bill were invited to a family wedding. 6:05 The NSW Golf Course at La Peruse. The bunkers were very deep and it was hard to get the ball out. It was also hard for women to physically get out. The bunkers were adjusted for better access. Otherwise it was a very pleasant golf course to play at and caddies were provided for players. 9:51 Bill once won a fridge in a ‘nearest to the pin’ competition. They were both thrilled because it was much better than the one they owned. Margery said the purses were good and players were happy with what they won in competitions. 12:08 Measuring the holes for the NSW Golf Union. They used a type of tape. They did this to get a rating, a handicap for the people playing. 13:53 Preparing the balls for the Beverley Park Night Range: Margery’s and Bill’s backyard was covered in wire mesh that allowed golf balls to rest and dry on the wire without falling out completely. Margery used to roll the balls in good white paint between the palms of her hands in such a manner the paint stayed put. And then the balls were turned over to dry. A red dash was put on all the balls to show they belonged to Bill’s night range. This was done to thousands of balls. 18:31 Margery’s thoughts about the sometimes very short skirts worn by golfers such as Jan Stephenson. Jan was once asked to wear a longer skirt. The Royal Australian Historical Society has an established tradition of conducting history lectures, workshops and seminars including its popular Day Lecture series held on the first Wednesday of each month. Since June 2012, RAHS Digital Media Officer Graham Sciberras has been recording these events in an effort to make them available in to a wider audience. The Society would like to thank the speakers for allowing these lectures to be podcasted. The diaries of Alexander Brodie Spark provide the first reliable evidence of golf played in Australia. On 25 May 1839 golf commenced at Grose Farm and on 1 June 1839 the NSW Golf Club was instituted. Three puzzles have surrounded the 1839 golfers. What triggered them to start golf? Why did the NSW Golf Club have such a short life? How was the 1839 club connected to the Royal Blackheath Golf Club, London? Join Michael Sheret, who has researched and published in golf history, and Norman Richardson who will unravel the puzzles at this RAHS Day lecture. List of other relevant documentation Scanned handwritten notes about Alex Mercer written by Shirley Mercer (spouse) and scanned newspaper article. All attached. 50:05 Dave won 56 pounds in the Killara Cup, 36 holes played with 40 professionals and 40 amateurs competing together; Dave came first.Club purse prizes, not tournaments – 18/36 holes for100-200, even 50 pounds approximately. In the past, major world players competed every year in Australia, for example, champion golfers such as no. 1 Gary Player, Jack Nicklaus and Arnold Palmer built up Australia’s circuit for the love of the game. They were given a caddy, air fares and maybe the hotel accommodation, though not extravagant, and possibly the wife’s expenses. Tiger Woods wanted 5 million to play in Australia. Other players expect similar amounts. As a result the international players don’t play in Australia. 57:10 Alex’s work with a champion player with a disability and the enormous satisfaction from the process. Player rang from Hong Kong to proudly tell of his winning a medal. Alex talked of working with NSW squads. Alex explained the satisfaction of following the careers of successful and not so successful players; they become part of the family. Dave loves the bond as well that lasts to this day. ‘A lifetime of interest’. Dave and Alex both spoke of rapport. Alex coached all levels and sexes in New Zealand for 20 years – Girls, Ladies, Juniors and Men and recounts a major international win for NZ (1994 World Amateur Team Championship) in Vancouver, 47 countries played. Dave had to concentrate on working within Killara Golf Club and appreciates the satisfaction from the thousands he has taught over the years. Families have lessons through the generations. Alex left Royal Sydney because he had felt restricted with teaching club members only. 1:03:27 Golf equipment. ô At Killara there was a fulltime club maker employed for 20 years, making and mending golf clubs. 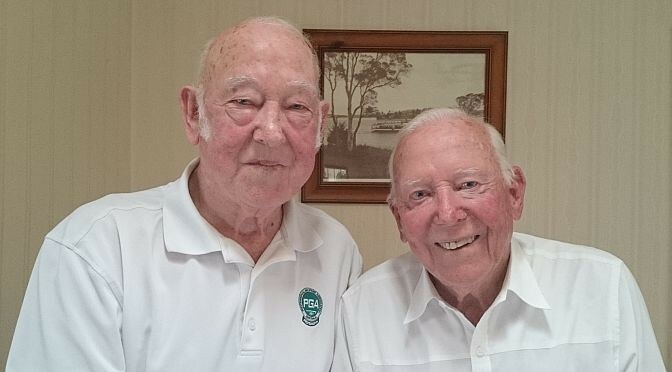 They both had to do a practical exam to become a golf professional and a member of the PGA – for example, make a driver with a shaft, block of wood, a brass plate, a piece of fibre inlay and some screws. They also had to make a grip from scratch. Unless you had practical skills you were of no use as a Club professional.ô 1976 still optional to play with small balls in Australia. Had to change to big balls (1.68) in England as Alex found when he played a tournament in Britain in 1976.ô Alex and Dave used to reconstruct balls and put on a new case/cover during the war years because of the rubber shortage. Covers can’t be cut on modern balls. A uniform ball size made the game around the world a better game. New balls behave consistently for players; balls don’t go dramatically off-line unlike in the past. ô Tees are much longer now because drivers are so deeper in the head. The sweet spot has changed to higher. Low tees would not work with modern heads. ô Clothes: Players wore shirt and tie up to the 1960s / 1970s, eg Alex for Pro-Am tournaments as a Pro at Royal Sydney. Clothes are now purpose designed and this makes the game more comfortable. 1:18:35 Costs have escalated for membership of the PGA. Significantly cheaper than when Alex and Dave began. From oversea came the idea to have 2 membership associations. One group for club professionals and another for tour golfers. Has returned from 2 factions to one body: professionals and tour players combined. As PGA chairman Alex didn’t want the PGA to separate into 2 groups. System works in USA because of the much larger population much greater financial backing for golf. The Tour players faction went broke. They lacked infrastructure to organise tours without the PGA club professionals. 1:21:23 Alex: If you don’t love the game get another job. You must contribute to the game, teaching or playing. Dave: Get a good education before you turn to professional golf. You must love the game. 1:23:40 Thanks from ‘two old golfers’. Conclusion of interview.